Improve productivity, manage compliance and enhance communication. Core Inspection allows you to quickly produce visual certificates, test certificates and equipment registers quickly and easily. 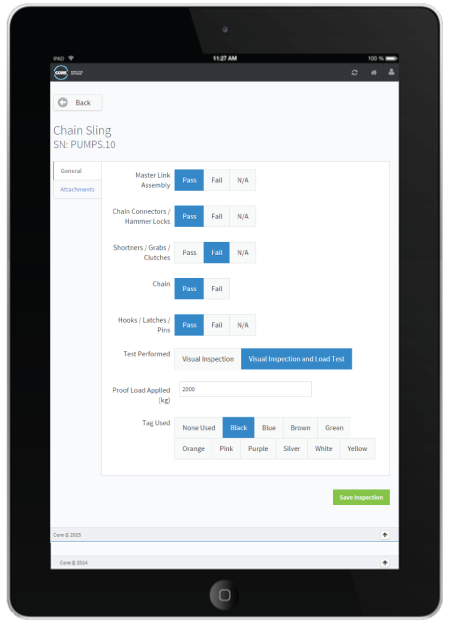 Quickly perform inspections on a mobile device. When the technician next connects to the internet your customer’s certificates will be available to send. Minimises the time between inspections, servicing and job invoicing. Works online or offline, syncing when connection is re-established. Automated service and inspection alerts ensure nothing gets overlooked. Provides body of evidence that all service and inspections have been actioned. Creates an inspection register and test certificates for you and your customers. Sets a clear operational framework for all service and inspection work to be performed. Service dashboard alerts all stakeholders to risks. Provides a structured program for identifying equipment defects. Helps meet “end of life design” obligations. Structured servicing helps amortise equipment and machinery costs.